This is a drawing of a manor house in Hull acquired by the King in 1539. 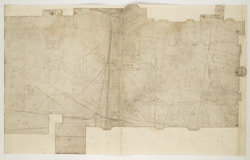 The plan dates from 1542. Four plans of this building survive, all drawn by John Rogers. Rogers, a master mason employed by the king as a military engineer for work on Hull’s defences, had to make alterations to the house to adapt it for defence and as a Royal residence. Such defences became necessary after Francis I of France, and Charles V Holy Roman Emperor and King of Spain signed a peace treaty in 1538. This union gave rise to the possibility that France and Spain may combine forces to invade England. France was England’s historical enemy and Henry VIII’s divorce of Catherine of Aragon, Charles V’s aunt, had offended the militantly catholic King of Spain. Hull was one of many coastal areas which were surveyed and fortified. A feature of this plan which merits special note is the unusual T-shaped staircase. This is similar to one at Bridewell Palace in London. Spiral staircases also feature. The plan shows two large rooms with smaller chambers surrounding them, an arrangement that would accommodate King, Queen, their respective entourages and staff.